Annette was invaluable in this process! Annette is fair and logical in her analysis and advice. Thanks for everything, Annette. You were very helpful during a difficult time. This process really clarifies my goals! I really feel that I can do this now! Annette was invaluable in finding flaws in the other parties submissions to the courts. Don’t be cheated by lies; a Certified Divorce Financial Planner can make all of the difference. 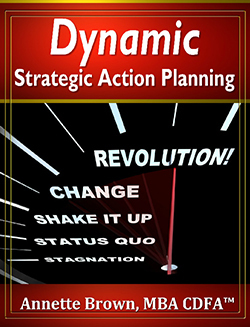 Effective Strategic Plans take action. They are used regularly, reviewed regularly, change regularly; they are dynamic and fluid by design and intent. Regularly corresponds both to your business cycle as well as the cycle of goal and goal-ette completion. Examples of businesses and their logical cycles follow: a non-profit building homes in impoverished areas might be reviewed on a project basis, while a start-up business might be reviewed on a weekly basis. Copyright ©2019. Annette Brown, MBA, EA, CDFA™ All Rights Reserved.